All photographs seen here were taken with the Sony a7rIII, Sony Gmaster 24mm f1.4, and Hoya intensifier. Minor edits and adjustments were done in Adobe LightRoom CC with a boast in exposure by +1.5. Camera settings - 20 seconds / f1.4 / ISO 800 / incandescent. Lets just start to say what’s not to like about a lens that is built like a tank, so small in size and comes in at a whopping 15.70 ounces! A lens that is so sharp wide open at f1.4 producing ideal points of light in the very extreme corners with little to no and I can emphasize the NO signs of Sagittal flare. Its a dream come true for a astrophotographer I tell you! 100 % crop in of top right corner from photo above. It really does feel like Sony tailored this 24mm f1.4 especially for the astrophotographer community. This lens answers the call for a really fast wide angle lens that can REALLY produce superior results. Seeing is believing and I am confident that when the word gets around of how TRULY amazing this Gmaster 24mm f1.4 is, it will be called the holy grail of lenses for astrophotography. The lens is truly a piece of engineering genus with its magic coming from new Sony technology. It introduces two XA (extreme aspherical) elements to the mix which significantly control spherical aberrations for a high degree of image sharpness and clarity. I can’t begin to tell you how blown away I was when shooting with the 24mm f1.4. Yes, the points of light tighten up in the corners when stopped down as you can see in the pictures provided below. But, I honestly can’t believe this lens is sharper at f1.4 than most 2.8 lens out there. It’s pretty darn mind blowing to say the least. This allows me to capture the night sky wide open at f1.4 with confidence at a lower ISO while taking full advantage of the Sony a7rIII dynamic range. It results in a much cleaner image after editing has been completed. Stressing yet again it is a astrophotographers dream lens come true. 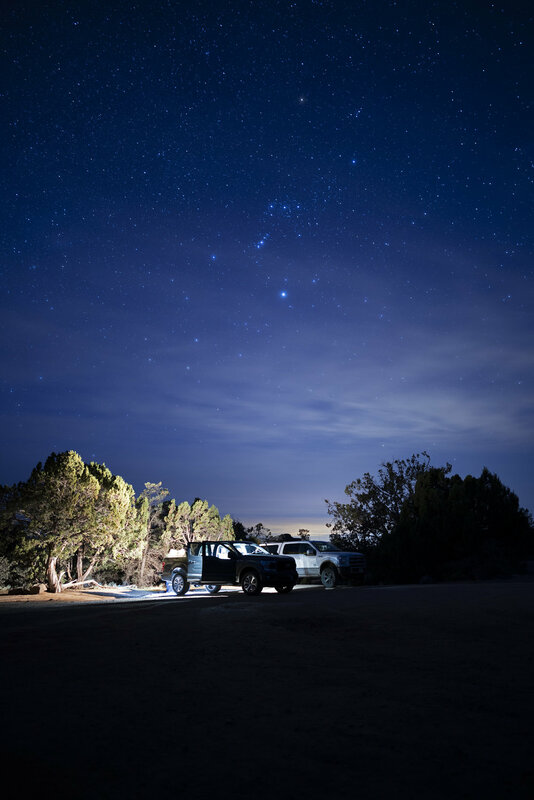 All images above were captured at 20 seconds / ISO 800 / incandescent color balance. F stop cycling from f1.4 - 2.8. Same Adobe LightRoom edit was applied to all images. Some simple adjustments and a exposure boast of + 1.5. Not only is this 24mm f1.4 the king of spectacular night photos, it excels across the board as a excellent lens for surf, landscape and even in the professional world of video. I’ve used it already on some commercial video projects and I can’t leave home without it now. With its de-clickable aperture ring, its focus hold button and buttery smooth aperture ring, it stands as one of my new favorite pieces of glass to reach for while shooting video. Captured in 1.5 crop mode equaling a new focal length of 36mm. Camera settings - 15 seconds / f1.4 / ISO 800 / incandescent. I love this lens to death! I give it a genuine 10+ across the board! If you are looking for proof, here are those images you have been waiting for to see for yourself. I’ve tested all the brands in this 24mm range category and trust me, no other 24mm f1.4 comes close! The Sagittal flare and comet-like stars while wide open on all the other competitors are so bad that you have to stop them down greatly to even come close to what the Gmaster can produce at f1.4. This is by far the first 24mm that can produce ideal next to perfect points of light wide open at f1.4. Camera settings - one shot @ 40 minutes / f4 / ISO 400 / incandescent. If you are considering purchasing the Sony Gmaster 24mm f1.4, I stand by my statement that it’s worth every penny! And again I would greatly appreciate it if you could please use the affiliate links provided in the story as they cost you nothing extra and it allows me to keep doing what I’m doing. If you have any other questions, please feel free to leave a comment below. I would be more then happy to help you out.